Do I add another 3 to the city? Cardcassonne Type: new release, Card Games Number of players: 2-5 Age of players: 8+ Length: 30-45 minutes Languages Available: Suggested Retail: $29.95 Release Date: November Status: In Print Game Description: Do I add another 3 to the city? Then I can add my follower next turn and score lots of points. Of course, then another player may claim the row and score those points.. So, what is the answer, add to the row or maybe claim it now. Oh, what a dilemma. In Cardcassonne the players place their cards in rows so as to make each card as valuable as possible. A player may choose to protect a sequence of cards with a follower, but when to do so is the problem. That brings excitement to this fast, merry card game. 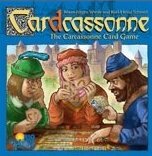 Other products in the "Carcassonne" series. Euro Card Sleeves (59 MM X 92 MM) 100 ct.
A spin off game from the original Carcassonne. This game definitely is worth looking into, especially if you prefer card games to board games. Nicely continues the theme of Carcassonne and is quite easy to pick up whether you are a new gamer or have been playing for years. This is fun to play whether you are a fan of the original Carcassonne or not.